Brand new perks and discounts added to your Concierge Card, plus upcoming limited engagements, money-saving offers, and much more! Having trouble viewing this email? Click here to view our online version. Click Here to View all Discount Packages ? Call 1-866-279-1448 today for the best Holiday Vacation deals on lodging, show tickets and vacation packages. Don't miss out on spectacular limited engagements! Click Here to View all Limited Engagements ? Click Here to View all Shows & Attractions ? 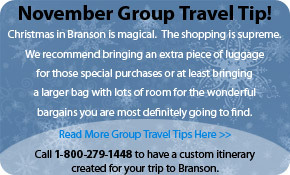 Get the inside scoop on planning your Christmas Vacation to Branson with this free vacation guide sponsored by the Branson Tourism Center. The 2011 guide is complete with articles on things to do, superb shopping, exceptional dining, top-notch shows, mountain lodging, and in-town cozy hotels. This is your one-stop vacation planner for Branson. Cozy up with these top hotel picks! Click Here to View all Hotels & Lodging ? "On behalf of the 589th Engineer Battalion Association (Vietnam), I want to thank you and your staff for the services and support extended during the Reunion planning and the period 15-18 September, 2011 ... The experience was enhanced by the friendliness, attentiveness and professionalism of you and your staff. Our sincere thanks and appreciation for helping make this a most positive experience by attending to so many of the logistical details which permitted us to focus on attending and enjoying the Reunion events."